Hai! There’s a giveaway buried deep at the end of the post. Cool stuff that I know you will love. What is cooler? You have the chance to win x3 because Tartelette and White on Rice Couple are also holding giveaways! Great minds… (okay, we planned it that way, but still!) You should totally enter all three. 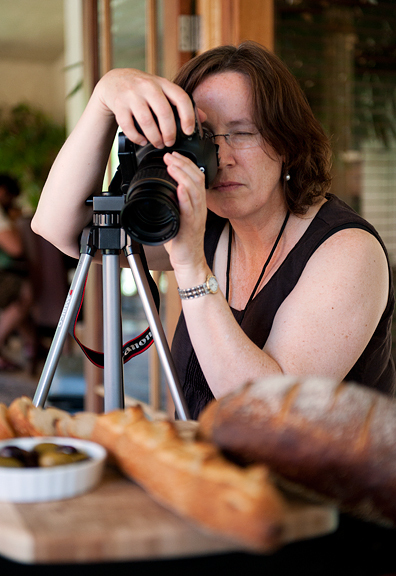 Few things keep me from this blog for long: chemotherapy, emergency surgery, and apparently food photography workshops. 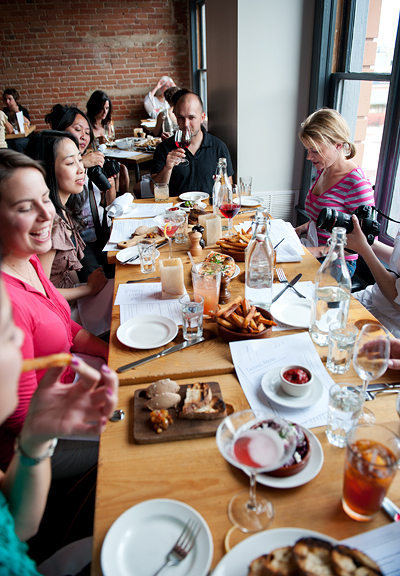 I should say running food photography workshops. Who knew?! I sort of knew, but now I really know. It’s an enormous amount of work and I can honestly say that Food and Light could not have happened without the logistical and technical support of Todd and Diane (veterans of organizing and running workshops), Jason (single-handedly built our workshop a new network when the venue’s network was brought to its wobbly knees), and my Jeremy (for everything) – four people who consistently go above and beyond without ever being asked to. They did me a solid. Thanks, guys. Don’t even start to think that this workshop rocked on the efforts of just five people. No way. Helen, The Maestra, pwned the styling like nobody’s business, always happy to share tips and experiences with workshop participants. 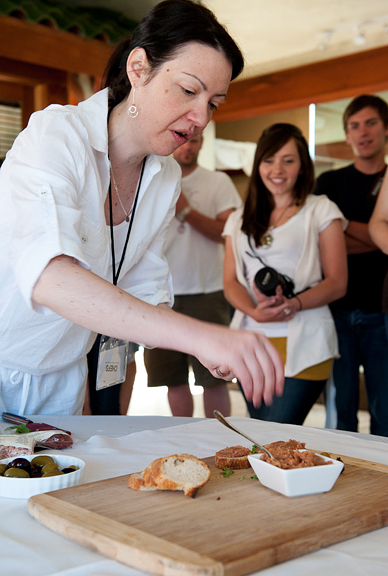 She even demonstrated how to turn unsightly bean dip into something marvelous. 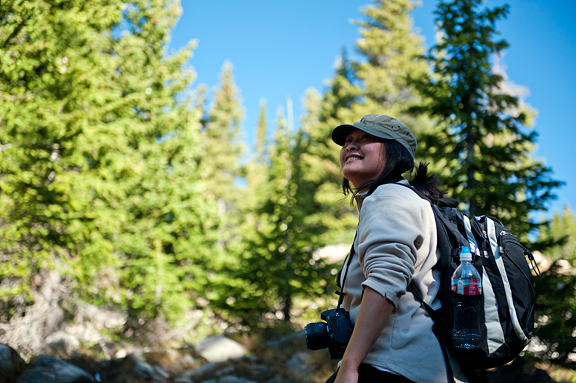 Pro Photo Rental provided us with several beautiful professional lenses for folks to try out. 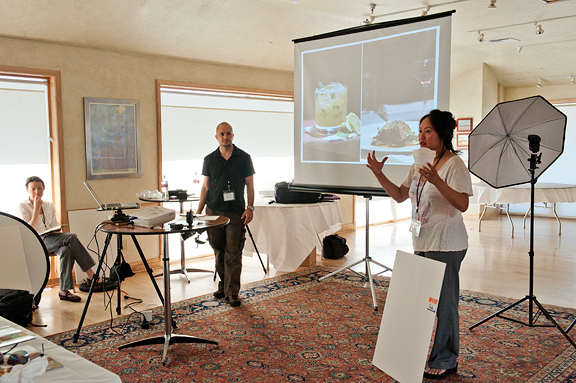 Matt and Nicole graciously presented stunning pastries to the workshop each morning for shooting (and eating!). Special thanks to Lisa, Anita, Dana, and Annie for staying behind to help us break down the venue (and break out happy hour at The Kitchen Upstairs). 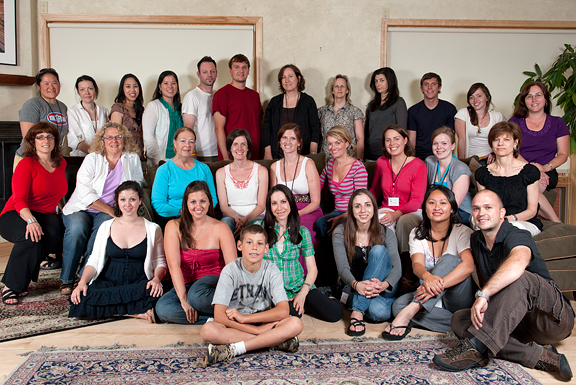 Most of all, I cannot emphasize enough how wonderful our workshop group was. We had good people. I mean, we had truly kind, generous, friendly, enthusiastic people in attendance. You could not have picked a better crew. They listened, asked questions, shared with one another, helped each other, and created an excellent atmosphere for learning. And that is what the workshop was all about – learning. Having spent a billion years in graduate school watching some good and a lot of bad instruction, I have my (strong) opinions about teaching. We didn’t want to load the workshop with lecture after lecture. Heck, if that were the case we instructors would have walked out on ourselves! Two-thirds of the in-session workshop was reserved for hands-on, one-on-one, run-with-it time. They ran with it. 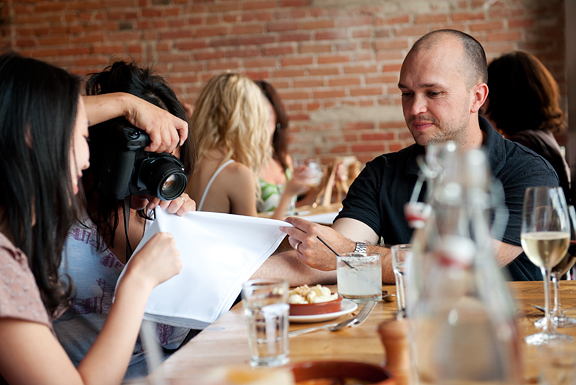 Even lunch time was part of the workshop because we gave an assignment to photograph in a restaurant setting. I can just imagine the surprise of the staff when half of the attendees who went to The Kitchen for lunch whipped out their cameras once their food arrived. Somehow between all of the lessons, demos, hands-on sessions, exploration of downtown Boulder, and networking, our fine group managed to process and upload their photos for our final awards which included giveaway prizes from our amazing sponsors: two (2) $100 gift cards to the Culinary School of the Rockies, five (5) $100 gift cards for CHEFS catalog, two (2) beautifully-crafted knives from New West Knifeworks, and a heady spice set from Savory Spice Shop in Boulder. It was over before we knew it and there were hugs between friends old and new as attendees said their thank yous and good-byes. Our small group of nine headed to The Kitchen Upstairs for an undeniably happy hour. We did it!! Thanks to all who made this happen. food makes up for lack of sleep, right? More farewells and then it was back home to the mountains where Kaweah happily greeted Todd and Diane who had come to spend their last evening in Colorado at our house. The next morning we took them for a pleasant hike into our beloved high country which is priming for peak wildflower season. this air isn’t like los angeles air! Before Todd and Diane left for the airport, we enjoyed a relaxed and beautiful late lunch at L’Atelier, another favorite restaurant in downtown Boulder. Don’t forget to enter over at Tartelette and White on Rice Couple to increase your chances (check out the gorgeous photos on both posts – that’s why theses guys are teh awesome). Good luck! Disclaimer: CHEFS catalog sponsored our workshop by donating these supplies. Hmmm…..I guess my favorite summertime snack is coconut fruit pops. That’s a cool workshop. Love the photos. Wow, you had a lot of folks there! Awesome. Lucky folks to learn from you. My favorite summer snack is simply a sun-warmed tomato fresh off the vine from my garden, sliced and lightly salted. You just can’t get that flavor any other way or time of year. Big Stick popsicles! We used to be able to buy them for 25 cents at school during the summer. They cost a bit more now, but they’re still just as good! My favorite summer treat is lemonade or any fruit-based drink. I don’t have a favorite summer food, though. It used to be ice cream or gelato. Lovely photos! I’m so glad everything moved along so smoothly and successfully. I wish I could have attended. Bruschetta. And wonder of wonder my son has discovered that he loves it too. Quite a leap for a kid who thought that the only acceptable form of tomato was ketchup. Tomato sandwich, lots of mayonnaise, have to eat it over the sink because it’so juicy! Since we grow a buttload of cukes, my favorite summertime snack in a bowl of thinly sliced cukes, a little salt, a splash of balsamic vinegar and a fork. I can eat a ton of tabbouleh in the summertime! It’s so cool and fresh. I forgot how much I love them until I got them in my CSA basket this week- fresh sweet peas in the pod! crunchy, cool, sweet, yummy! Fruit! Berries, cherries, peaches, melon…It’s so good to have fresh fruit. And that includes tomatoes. Fresh tomatoes eaten out of hand like an apple! Wow. The workshop looks awesome. Congrat! My favorite summertime meal is gaspacho but it’s not really a snack. I’ll have to go with fresh berries (any kind) that are in season. Corn on the cob from the farm stand! Fresh cucumber right off the vine. My favorite thing about summer is fresh cold watermelon! My favorite summertime snack are all the great fresh berries and stone fruit from the farmer’s market! Watermelon and feta is my favorite summertime snack. Honestly, my favorite snack is cottage cheese and pears. I could eat that for every meal – and most of the time is all I want! watermelon…spitting out the seeds and the juice dribbling down your chin! Looks like such a great workshop! Will this be an annual event? I love to snack on fresh blueberries or cherry tomatoes in the summer. Strawberries are my favorite summertime snack (all-year snack, actually). Mine would either be watermelon or sweet corn. It’s so perfect this time of year! 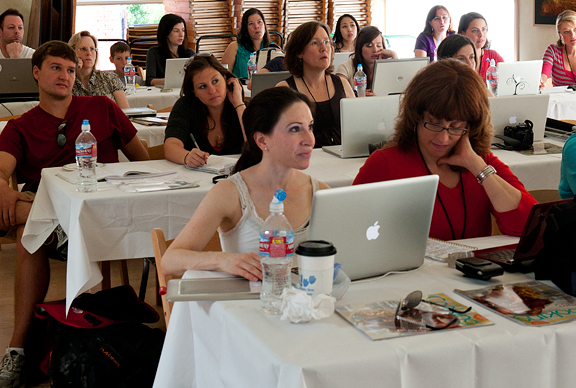 wow, that looks like an amazing workshop! i need something like that :) my fav summertime snack is definitely fruit, the melon varieties most refreshing! My favorite summertime snack is a garden-fresh tomato, perfectly ripe, sliced on a plate and sprinkled with salt. Nothing better. Cucumbers! I can eat a whole cuke in about two minutes. Fruit right off the tree. I love those u-pick places! What a great turnout for the workshop! My favorite summertime snack is either watermelon or cherries. Tomatoes – simply chopped and sprinkled with salt and pepper. If I could eat only one thing for the rest of my life, it would be summer tomatoes! My favorite summer time snack is sunflower seeds. We take them on very road trip and vacation. summer tomatoes, fresh mozzerella and torn basil. sprinkle with s & p and drizzle with olive oil. nothing is better. My favorite summer time snack would have to be frozen grapes & bananas. Healthy & so tasty too! favorite summer time snack is ice cream – ANY KIND! My halfway between a slushie and a granita summer cooler. Frozen blueberries, cranberry juice, simple syrup, vodka, ice. Crush, stir, enjoy. My favorite summertime snack is a juicy plum eaten outside so it drips all over the grass. Tomatoes on a plate of melted cheddar. Kind of takes the healthy out of it, but dang, it’s good. Wow that’s a hard one! Hmm my favorite summertime snack. I guess since I absolutely love tomatoes and avocado my favorite summertime snack would have to be chips with homemade salsa and guacamole! Sometimes I even chop up some avocado and add it to my fresh salsa and oh my gosh it is delicous!!! Guess I’ll be making that this weekend lol. A wonderful bread, toasted, buttered and sliced fresh homegrown tomatoes on top. Love all the pictures from your workshop. Hopefully I will be upgrading my camera soon and ready to participate in the next one. Ice cream is my favorite snack, of course! I love fresh strawberries from the farmers market. Nothing better! Favorite snack ANY TIME is ice cream! THANK YOU for that shot towards the end where the napkin is being used to bounce the light! So simple but I wouldn’t have thought of it. I bet you could also use a clean white plate in a restaurant setting. My favorite summer snack would have to be a garden tomato with just a little salt and olive oil. I could eat a plateful. Its hard to pick a favorite snack but I’m going to go with raspberries. My favorite summertime snack is tomato and olive oil on toast. I usually eat it at least once per day as long as I can get my hands on some good tomatoes. My favorite summertime snack are bananas! Thanks for the giveaway! I love fresh raspberries by the handful. I am so envious. Thanks for sharing and I love the pictures. When is the next workshop? I wish I could have been there. 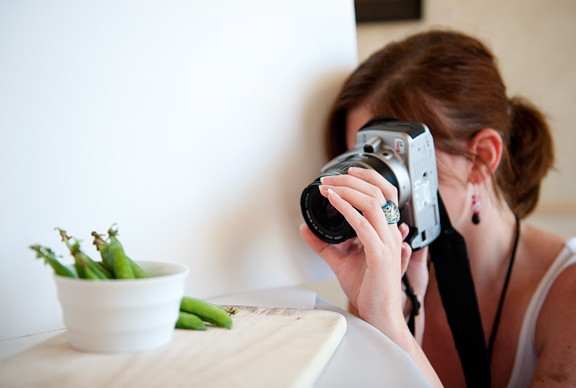 Each of you and your blogs are a source of daily inspiration, both in the kitchen and behind the camera. I would have to say lately, my favorite summertime snack is half an avocado with a sprinkle of salt. But I’ve never been able to resist a slice of cool watermelon on a hot Virginia day! My favorite summer time snack is definitely ripe watermelon. Even though it’s only 71 right now here in Madison, I’m even having watermelon for breakfast! [Not a contest entry.] Congratulations on a great work shop, you guys did awesome! Anything with fresh tomatoes and basil. I also highly enjoy fresh berries and stone fruits. It’s a little time consuming but my favorite summer snack is a raspberry brown butter tart. I wait all year for raspberries to be back in season and then the tart only lasts a few days! Great post, it looks like you all had a blast! Summer tomatoes with a little sprinkle of salt! Looks like an amazing workshop! I really wish I could have attended. Maybe next time? My all time favorite snack at the moment is picked sugar snaps. So delicious. Cherry tomatoes right off the plant when I’m working in the garden. What beautiful photographs, I’m glad the mountains are getting some publicity over here (seems the beach is all the rage!) Thank you for the inspiration. When I was a little girl and emphatic non-vegetable eater, my Nana walked me into the garden, picked a ripe tomato, and said, “Take a bite.” As terrified of tasting anything so outrageously colored (brown and white were safe to me), it never occurred to me not to do what Nana said, and thus began my love affair with summer tomatoes straight off the vine and warmed by the sun. Amazing workshop. Congratulations…I know it was a lot of hard work, but seems to have really been worth it. My favorite summertime snack is a homemade milkshake, with real cocoa, and runny enough to drink through a straw. Yum! Homegrown tomatoes… in salads, sandwiches, soups, or eaten like an apple! My favorite summertime snack is homemade cantaloupe sorbet…yum! Very cool and refreshing! Favorite summertime snack? Lately it’s been berries of any kind with Greek yogurt, which I just discovered and can’t believe I have gone so far in life without. ADDICTIVE. But before that, it was tomatoes for sure. Thanks for sharing the workshop with us Jen. Wish I could have been there! boiled peanuts. so yummy and salty. Whichever fresh fruit is in season. Can’t beat a perfectly ripened fruit. My favorite summer snack is sourdough bread with a smear of goat cheese (or a dollop of cottage cheese) topped by a slice of red ripe tomato, with a bit of salt and pepper. It’s kind of my standard breakfast around here. My favorite summertime snack would have to be a freshly picked peach. snap peas fresh from the garden! mmmm. Great workshop! Thanks for sharing!! homemade popsicles! I make a couple with the dregs of what’s left in the blender from smoothies, so we always have a variety on hand. (and helps with the portion control for the smoothies themselves). Yay for ripe fruit! A bowl of cherries. So summery! Chips and Guacamole….in the shade, by the pool, with a margarita in hand. Tomatoes + salt + basil = a tickle in my pants. Cold watermelon straight from the fridge. I could eat non-stop all summer long. Speaking of which…. Ice cream all the way in every form or manner. My favorite summer snack is pastries, odd yes, but that is what baby to be is craving these days so I can’t argue. Peaches right from the orchard in Romeo, Michigan! Looks like it was so fun! Favorite summertime snack- peaches. Preferably white peaches, with some white wine! Tortilla chips and homemade salsa fresca – with a nice cold beverage, of course! Tomatoes and basil from the garden with fresh mozzarella! Honestly, my favorite summer snack is fresh fruit. It makes me really appreciate the concept of eating seasonally when I bite into a perfectly ripe peach or cherry. I’d love to go to a workshop like this, btw. 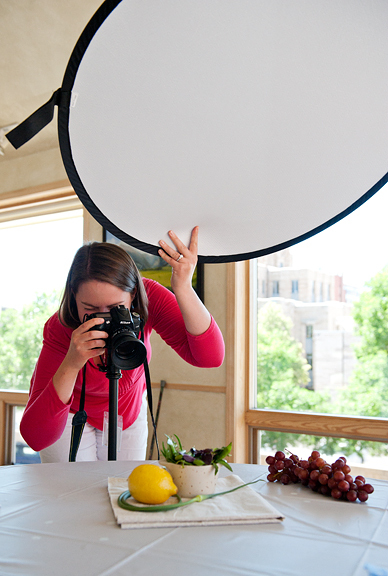 Food photography is intimidating, but you do a great job of it! My favorite summer snack is good bread, yummy cheese, and fresh tomatoes and basil from the garden. Yum! Wow, I want to go to this workshop if you do it next year for sure! Thanks for sharing photos here so we can live vicariously through them! Fave summer snack: hummus and pita chips. Doesn’t require the oven, stove, or anything hot to prepare it! Great workshop, I so would have liked to participate – next time I will, certainley!! The best summertime “snack” is corn. On the cob. It just screams summer! My favorite snack would be nectarines and apricots. I get so tired of apple and pears in the winter! Fav summer snack – any fruit in season, picked fresh and warmed by the sun – there’s simply nothing like it in the world!! And I do hope you guys do this again – would love to come!! My favorite summertime snack is anything freshly picked from the garden and tasting like warm sunshine! Hands down, cucumbers and hummus with a glass of mint limeade. I could eat that for the rest of my life. Fresh, ripe strawberries or cherries. Yum! My favorite summertime snack is probably a ripe tomato from the garden. I like a green bell pepper, perfectly ripe, sliced vertically like french fries. Delicious! I absolutely love anything melon and fruity. Thank you for your blog and the time you take to share your thoughts with us. I am a huge fan of yours and although I don’t post much I do want to say thank you. I just have to say that I love your blog! I live in Montana so many of your pictures are very familiar to where I live. I also love to cook and am a big fan of asian cuisine! I made your Thai cucumber salad and it was simply delicious! I could eat it all day! My favorite summer time snack would have to be homemade watermelon salsa…a simple blend of watermelon, red onion, cilantro, jalepeno, garlic, lime juice and a pinch of salt. Delish! Peaches!!! I can probably eat them all day, every day if given the chance. I’ve been eating about two a day for the last week! But now i’m out of them and must go restock.. =( What is YOUR favorite summertime snack? My favorite summer snack is yellow Korean melon, chamae. So sweet and yummy! Sweet peas off the vine, nothing better. Sun warmed cherry tomatoes picked off the vine and popped right in the mouth. They hardly ever make it to the kitchen! I love my daily smoothy with fresh fruit and yoghut – perfect start to the day! My favorite is a refreshing cold watermelon!!!! I just love your food blog. Keep up the good work! It’s so much fun to check your website often for great photos, observations & FOOD!! My favorite snack….it seems to be a theme….fresh picked local peaches….peaches in Sangria and a good ol’ tomato sandwich….it’s what my grandma fed me straight from grandpa’s garden. Just wish I could find one of those tomatoes now!! My fave summer snack is something I haven’t had in almost 2 decades: kala khatta gola. It’s shaved ice dipped in a sweet dark syrup that is hard to describe with liberal sprinklings of rock salt and other spices. It may or may not have a dose of giardia since the water used for the ice was always suspect. I have tried to recreate it at home but it doesn’t taste the same! Hee! Glad to have you back Jen and glad you had such a good time! Now I wish I would have plucked up the gumption to go to the workshop! Maybe there will be a next time. My favorite summertime snack are berries of any sort, straight off the plant. Closely followed by gelato. I WISH you could offer the conference in the Midwest! Please??!!! Fresh macerated berries with lemon zest-yum! I’m in the Watermelon camp. What about a conference in Seattle??? Lots of great food, markets (not just Pike’s Place, but great farmers’ markets), and TONS of foodies out here! berries! all kinds of berries. Great workshop! Loved the run-down and the photos. You live in God’s country, that high country is surreal looking. Wow. My fave summertime snack is watermelon. Eaten with salt on it, sorry! I’ve been making a ton of watermelon limeade and mixing it with tequila and turning it into margaritas! Woohoo! For snacks I’ve just rediscovered pickles. I can’t stop eating them! I love cherries in the summer! Bruschetta! Diced purple cherokee tomato, olive oil, basil and salt – on toast. Looks like you had a great trip and workshop! Thanks for sharing. My favourite summetime snack is heirloom tomatoes with goat cheese and fresh basil with a drizzle of olive oil, topped with fleur de sel. Looks like a great time! Wish I could have gone. ice cream over the top of lots of fresh summer fruit – especially peaches &/or blueberries. Strawberry shortcake is the best…too bad the season is all over! I’m super jealous that I’m having to read about this workshop instead of attending it! It looks to have been extremely informative. My favorite summer snack is vanilla ice cream with raspberry sorbet and blueberries. It’s red, white, and blue for all the USA holidays and super sweet and refreshing. My favorite summer snack is muesli. Make a big batch (yogurt, cut fruit, oatmeal) to keep in the fridge. Sprinkle with a few toasted walnuts, or serve with warm garlic bread for a light supper. My favorite summer snack are fresh berries and anything with Lemon! Cool workshop! Any type of fresh fruit! watermelon with salt is the perfect summer food! my friend from north carolina introduced it to me years ago and now i can’t get enough of it. I don’t have a favorite summertime snack…I’m lame. I love ice cold diet pepsi – or a frozen slushy mudslide. I rarely eat snacks, but I guess I’d have to say a Mocha Frappucino from Starbucks! Beautiful pictures of a fantastic event! I wish I could have participated. Next year? My favorite summertime snack is fresh berries. One favorite of mine is a simply a cold cucumber salad … thinly sliced cukes marinated in the fridge with water, vinegar, a bit of salt and pepper, and red pepper flakes. crisp and cold, with a bit of a kick! What an amazing event!! My favorite snack: Watermelon. Martini. The workshop looks fabulous. I hope you recover enough to do another one next year. My favorite summer snack is a freshly picked, ripe nectarine from the farmers market. My favorite summer snack is watermelon. I love watermelon, it’s the only topping I put on my froyo and I also like sprinkling salt all over it! My fave summertime snack has to be fudgecicles (sp?).. brings me back to my childhood gradeschool days. Also.. wish I could have attended the workshop since all my food pictures turn out blurry and very amateurish..
My favorite summertime snack is frozen grapes. Doesn’t get much easier than that! Great giveaway. Hope I win! My all time summertime snack would be tomatoes(freshly picked from my garden) with a little bit of salt and pepper. Ice cream! That counts as a snack in my book. mango sorbet :) with a hint of lime! My favorite summertime snack? Fresh berries of course! Love your photography and thanks for the giveaway. Tomatoes, cucumbers, and onions – straight from our garden. My favorite summer snack is sugar snap peas! I wait for that small window for them to be in season every summer. I never can make anything with them because I eat them all!! Caprese! Homegrown tomatoes, milky mozzarella, salt, pepper and dried oregano drowning in my husband’s family’s homemade olive oil. 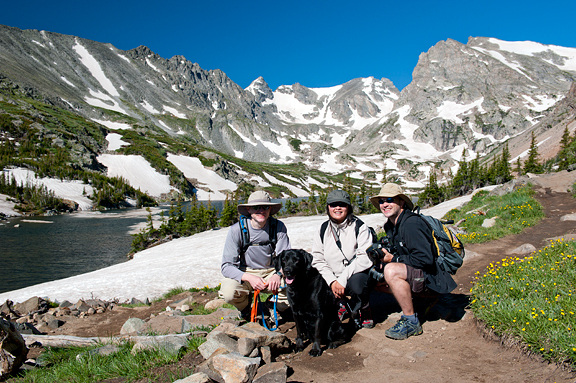 Beautiful photos of the high country! Wow… amazing! So jealous! Favorite summertime snack? Canteloupe!! What a wonderful workshop this must have been. If you do this again next year, count me in. Must to learn! I couldn’t go a whole summer without chilled mangoes. Delish. And to be extra decadent I sometimes dip it in coconut milk. My favorite summertime snack= fresh fruit salad with lots of yummy watermelon! i love grilled pineapple with cinnamon sugar! I love tomato bruchetta with capers and good olive oil drizzled over toasted baguette! Hands down – garden tomatoes, with fresh basil and big thick slices of mozzarella on top, drizzled with olive oil and balsamic. Love your site – thanks for the giveaway! My favorite is sweet corn on the grill with butter, lime and chili! Cleaned cold raw sugar snap peas! YUM! Thanks for sharing pics from the workshop. I hope there’s another in the works soon! My favorite summertime snack would have to be homemade peach ice cream. Yum! My favorite is fresh cherries! Wow, what a great workshop! My favorite summertime snack is drippingly fresh fruit. mmmm. Cherries! Thanks for the posting. Great photos. Congratulations on your successful workshop! Sun Sugar cherry tomatoes straight from my garden. Definitely strawberries! Cold watermelon is pretty delicious too though. My favorite summer snack is my blackeyed peas salad. It’s so refreshing, colorful, and tasty. Even my husband and daughter gobble it up. I love the pictures. thanks for sharing. I love to cook and create colorful meals but am too timid to try and photograph them usually. Lovely photos! My favorite summertime snack is absurdly simple: Olives. They’re healthy, delicious and if you look around a bit you can find them stuffed with just about anything you want. Great pictures….I would like to be entered for giveaway…! My favorite summer time snack is homemade quacamole and chips. I cannot get enough of it. When it is hot and I’m thirsty, I love watermelon. Our favorite summer snack is ice-cold watermelon and my pecan shortbread cookies. Any sort of ripe, fresh fruit. Beautiful photos! Favorite summertime snack? Fresh fruit! Preferably from the farmers market! What an incredible workshop! I love those food styling photos. Ice cream sandwiches! Neopolitin please! Oh, how I wish I could have attended the workshop. Maybe the next one? Truly inspiring. I know I will never be at that level of photography but it makes me want to work harder! Oh I forgot to share my favorite summertime snack.. which is watermelon!!! i never feel guilty eating tons of it. It has to be grape tomatoes, just picked and still warm from the sun. I love fresh cherries in the summer, so good right now! What a fabulous giveaway! Homemade ice cream is my favorite summer treat! fresh salsa! no, strawberry pie! no, ice cream! Creamy avocado ice cream is a favorite of mine for sure! Hummus or babaganoush with carrot sticks! Yum. Heirloom tomatoes w/ fresh basil and a balsamic reduction. radishes with butter and salt on a slice of baguette… or chips with homemade salsa and guac… or (this summer thanks to the ice cream attachment for my kitchen aid mixer) homemade ice cream! Looks like so much fun and learning! Currently my favorite snack is black bean and corn salsa on tortilla chips… but once tomatoes are ripe, it’ll be tomato sandwiches! Mmmm! Mmmmm dole all-fruit popsicles! I can hardly keep them in the freezer long enough, though, because my dad loves them too!! My favourite summer time snack is a ginormous 2 inch slice of watermelon. 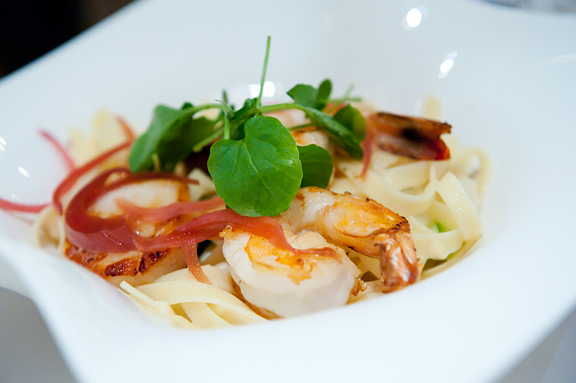 Love the photos – and the food – mmm. . .
Freshest, best tomatoes with kosher salt, maybe some ground hot pepper! Anything that comes right out of the garden and directly into ma belleh. Watermelon is my fave summer snack. Yum. Fresh fruit of all kinds, but especially dense, sweet watermelon. my favorite summer snack has got to be peaches – simple and wonderful! Just about any type of fresh fruit… but I made some mango lassi earlier tonight, and it definitely hit the spot! Definitely sliced strawberries, peaches or some blueberries (or a mix of all!) with yogurt drizzled on top. YUM! my favorite summertime snack is probably what i’m enjoying right now: a bowlful of fresh cherries! favorite summer time snack: fresh raspberries eaten with a handful of dark chocolate chips. This is also a lovely mini meal when you add some almonds and Greek yogurt. 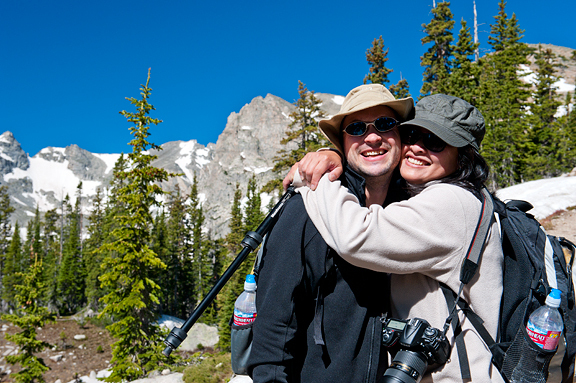 Love your pictures … definitely have to get to Boulder. Favorite summertime snacks are fresh picked strawberries and apricots. Yum!! Favorite summertime snack: juicy fresh peaches! Fav summertime snacks: Taiwanese style shaved ice (ice are made with water+ condensed milk). a must try for anyone!! Wish I could have attended that workshop. Congratulations! My favorite summertime snack is fresh local cherries. Favorite summer snack is definitely cold watermelon. Had some last night. Your conference looks amazing. Wish I could have been there. Oh man, I am so jealous! This looks like such a fun event! Naturally, I had to go check out the blogs of all the prize winners, as well. Thanks for all the great blog references! my fav summer snack is bruschetta, love tomatoes in season! My favorite summer snack is home-grown tomatoes. Mmm! I love all your pictures! They are beautiful! I wish we had something like that here! My favorite summer time snack is a fresh blackberry tart with homemade honey-lavender ice cream. Does iced tea count? I know it’s a drink not a snack, but this currant tea I’m drinking right now is amazing! Hard to decide – either sliced tomatoes, topped with cottage cheese and fresh cracked black pepper, or sliced peaches with a little nutmeg. Both delicious tastes of summer! Beautiful Pictures! My favorite summer dessert sitting in a mango tree while eating a mango. Mmmm ONO! Tomatoes! It is the only time I make BLT’s because the tomatoes are so fresh. And I love making tomato caprese now too! Yum! My favorite summertime snack is peach ice cream made at our local orchard. Yummy chunks of peaches, and oh so cold ice cream – the first and last bites give you brain freeze. My favorite summertime treat is fresh strawberries – I eat them all summer long and never tire of them! Thanks for the opportunity to win! My favorite summertime snack is fresh lychees. Looks like a great event – wonderful photos! Love snacking on cold cubes of watermelon on a hot summer day. Enjoyed this post — wish I had the talent to be a food photographer. Happy 4th! Frozen yogurt with fresh berries! Gazpacho. Made fresh from the garden. Yum. 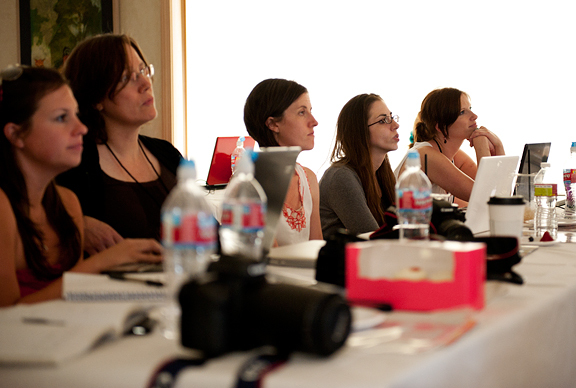 It looks like you put a ton of work into hosting this incredible workshop. I was reading on a couple of other blogs the wonderful welcome dinner. My favorite summer snack is very simple: cold fresh watermelon. My favorite summertime treat is good, ripe watermelon! favorite summertime snack…? so many, does pie count? :P or a fruity popsicle.. or fresh fruit from the farmer’s market. yum. Jen, can we do a repeat of Food and Light now? Pretty please??? What a super special time we all spent together. Funny how in just 48 hours our lives can be inspired and changed for the better. You guys organized a spectacular event. Each and every detail was well thought out & planned. All of the participants felt so comfortable learning from you guys. We covered so much ground, I was so excited to test drive some of the new skills when I go home. There is lots to digest, but I am all ready applying so much of what we learned. This looks like a totally awesome time! 1) Right now, my favourite summertime snack is cherries. And watermelon with Rollkeuchen (it’s a Mennonite thing). And rhubarb crumble. And fresh Alpine strawberries. I do in fact have a US shipping address. Because I live so close to the US/CDA border (less than a 15-minute drive), I can get things shipped to a wee little company in the wee little town of Neche, ND, where they’ll hold my purchase until I can pick it up (all for the grand fee of $2.00). How awesome is that?? My favorite summer snack is frozen yogurt with fruit. You can’t beat it on a hot day. the workshop looks like lots of fun and learning! Favorite summer snack is probably either fresh fruit half frozen or tortilla chips and fresh cold salsa and guac. My favor summer snack would be whatever fruit I can find fresh at a local farmers market. My favorite summer snack is a fruit salad (watermelon, cantalope, strawberries, blueberries, grapes, and bananas) drizzled with a little agave nectar. YUM. Hope I win! hmm. favorite summertime snack … vietnamese summer rolls with peanut dipping sauce; even though it takes me forever to make them, it’s always worth it. Hmmm…tomatoes or strawberries, but not together! Thanks for the chance to win! My fave summertime snack is simple. Quality vanilla ice cream with sliced, fresh strawberries. Thanks for an inspiring blog. Fresh berries. Looks like a fabulous workshop! My favorite summertime snack changes with whatever is in season. I love tomatoes with a bit of salt sprinkled on. Strawberries and peaches are my summer fruits. But it’s all about the tomatoes!!! Half a cantaloupe filled with vanilla ice cream! Fresh peaches, so juicy that they have to be eaten standing over the sink. I’m a Georgia girl! Fresh raspberries. Also black raspberries, blackberries, and blueberries. What a wonderful workshop to unite talented people. As a summertime snack, I enjoy a small bowl of mandarin segments with golden raisins! My favorite summertime snack would have to be granita. Delicious! My favorite summertime snack is fruit, whichever I can find — white peaches, cherries, watermelon, strawberries… there is nothing better! Glad the workshop went well! It’s so declasse, but in the summer, I totally crave my mom’s pasta salad with tricolor rotini, ham, celery, carrots and balsamic. She used to bring it to me when I worked at the pool as a teenager. It’s the perfect meal when it’s hot and you don’t feel like eating. My favorite summertime snack is strawberries. Actually, I could eat them all year long, but they only really taste good during the spring/summer. Thanks for your wonderful food blog! As the heat settles over the San Joaquin Valley during the summer months, Farmers Markets start to pop up every where. There are plenty of fresh fruits such as grapes, peaches, plums, and nectarines. There are also plenty of fresh fresh veggies to pick from. But the one thing I look forward to every year are the delicious sweet and juicy figs! On salads, on pizza with blue cheese and prosciuttio, or just straight to my mouth! It is the best time to be in the valley! My favorite summertime snack is homemade sorbet! Simply freeze your favorite fruits and add any herbs or juice and blend them together when you’re ready to have one. Healthy and refreshing! It’s a nice way to cool down from the summer heat! ^^ Thanks for the giveraway. Those are some nice tools to have in the kitchen! My favorite summertime snack is a Jersey tomato fresh off the vine, still warm from the sun, with a little sea salt and cracked pepper – that snack is summer to me! Thanks for the chance to win! Hope you have a wonderful July 4th! Seems like a lot of fun — gorgeous pictures and great giveaway! My favorite summertime snack is anything that involves tomatoes. A toddle out to the garden and a little (very little) knife work results in my favorite summertime snack — cucumber and tomato slices. A little gray salt and we’re good to go. Add a slice of lightly buttered, crusty bread and you’ve got lunch! That’s the ticket in my book. In hot humid Virginia, my favorite snack are sliced cucumbers, tomatoes and onions tossed with a little olive oil and red wine vinegar. Ice cubes are added to cool in down. Congratulations on your workshop and thanks for sharing the pictures. My favorite summertime snack here in Texas would have to be grilled jalapenos stuffed with jack cheese and wrapped in bacon!!! Workshop looks fantastic….good for you! My favorite summertime snack is a fresh juicy peach bought from the stand in Hamlet, NC on the way to Ocean Isle Beach. Thanks for the giveaway offer! My fave summer snacks are berries!! Great giveaway. i am really enjoying watermelon this season! I love having yogurt with whatever fruit that is in season. Strawberries, raspberries, peaches, etc. Just picked a contain of fresh blueberries off the bush last night so can’t wait to have some!!! Pictures look great. i love fruit, especially fresh berries in the summer! my favorite summertime snack is a fresh peach from my peach tree or a tomatoe from my garden. There is something to be said about walking out the door, picking the fruit and gnashing on it all within a few minutes and bites. Fresh fruit! Can’t get enough! I live in North Florida and the Georgia Peaches just came in season! I ate 3 perfectly ripe peaches in the space of an hour! Plan to do the same today:) Right now, Peaches are my favorite summertime snack. But all fresh ripe summer fruit is the best. Looks like it was a fantastic workshop! My favorite summer snack-food has to be ice cream. I could eat it for breakfast , lunch and dinner! s’mores, s’mores & more s’mores! watermelon. plain, cold, full of seeds for spittin. Not very original, since I agree with several commenters here–Watermelon. Our neighbor just told us to take the two watermelon from his garden that grew through the fence onto our side. It’s very hot and humid in Florida and sweet, juicy watermelon hits the spot. Any summer fruit. I really enjoy the berries. Fresh tomatoes from my garden, still warm from the sun. My favorite summer time snack are tomatoes! Cherries – be they Bing or Ranier. Very seasonal here so I treat myself whenever possible. My favorite summer time snack – fresh fruit. 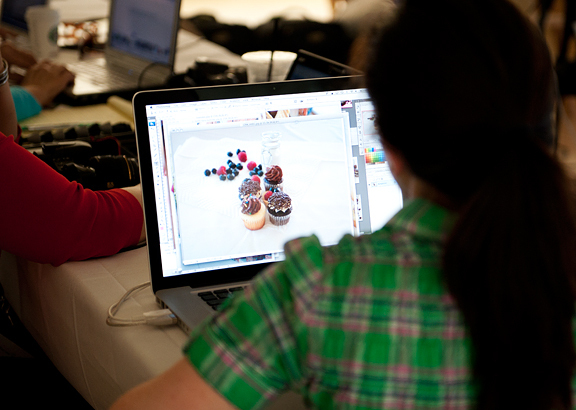 thanks for sharing – the workshop looks like it was great fun, and the food pictures are stunning! favorite summertime snack?? fresh fruit, definitely! I find it difficult to have one favorite of anything, but since they’re only available in the summer, I’ll have to go with cherry tomatoes straight from the bush. I don’t know if a beverage counts as a snack, but I love lemonade with frozen blueberries. I buy tons of fresh blueberries when they get cheap, and I freeze them myself. After I discovered that they were great to pop onto cereal (because they keep the milk really cold and defrost quick), I decided to try them in lemonade. Yum! I don’t bother with any ice, I just put a handful in, drink the lemonade, and then eat the blueberries. I love white sangria with cooked mint infusion, chunks of pitted cherries, nectarines and cut oranges. Healthy AND you get a buzz! I so wanted to go to this. Family stuff got in the way. Next time I will have no excuses not to attend! I have so many favorite summertime snacks, but I would have to say my favorite is a homemade s’more! Making graham crackers, marshmallows and ganache today for tomorrow’s 4th of july celebration! Running amok in my garden after work. I make a small plate of assorted crackers, baguette slices, and cheese slivers. Taking my herb scissors, knife, a small basket and a cutting board outside, I clip some chives, basil, mint, parsley, and a tomato. Along with an iced tea or water, my DH & I sit and talk and watch the backyard birds over crostini with iced tea or ice water. doughnut peaches, hands down. Can’t wait for them to finally get in season out here in PA. That workshop looks like it was such fun. Gorgeous photos of the mountains, too! Hmmm… favourite summertime snack? It would have to be farm-fresh organic strawberries. And cream … definitely cream. Love the recap of the workshop! My favorite summertime snack is picking Apricots right off the tree and devouring them! The workshop looks awesome, I love photo’s of food!!!!! Fresh and perfectly ripe peaches. Great post, and a wonderful workshop! my favorite summertime snack: watermelon! Love your photos. The workshop looked unique and like so much fun. My favorite summer snack is fresh uncooked corn on the cob with fresh lemon or lime squeezed on – nothing else needed. I would say clafoutis because WA cherries are in season right now and easy to whip up at the last minute! My favorite summertime snack would have to be Homemade Ice Cream! My favorite summertime snack is definitely blackberries. My mom used to take us to pick them at a local park and we’d come back and fix all kinds of delicious berry treats. My favorite summertime snack – fruit salad (any combination, really)! Thank you for hosting this wonderful giveaway. Looks like you had an amazing time! I love the sharpness and colors of your photos. Black or Red plums are my favorite summer snack. Mix it all up in a bowl and eat it with (or on) good crusty bread. Heaven. I love a piece of toast rubbed with garlic and covered in fresh ripe tomato slices. Blueberries with my home made greek yogurt are the best – or, watermelon with pepper. Yum. What a wonderful class! My favorite summer time snack would have to be chilled fruit salad. Favorite summertime snack…fresh cherries. Add yogurt, and it’s a meal! Gotta be watermelon! So refreshing and sweet! My favorite summertime snack has got to be ice cream! Homemade of course!!! Chips w/ fresh salsa and guacamole…and a margarita, of course! Stone fruit- peaches, nectarines, cherries… yum. Fresh fruit, it is so easy to eat healthily during the summer! It’s been fun to read what everyone else likes. Got some yummy stuff to try!!! My favorite summertime snack is definitely a watermelon smoothie. So refreshing! Thanks for the giveaway! When I was little at the local pool, the Quarry, I would always get a pretzel rod with a healthy dose of yellow mustard over the top. there is nothing better than cherry tomatoes picked right off the plant, warmed by the sun, squirting their concentrated flavor in your mouth–summer at it’s best. I’m really digging a slice of toast with butter and marmite! My favorite summer snack would have to be fruit salad with strawberries, blueberries, peaches, cherries, yum. My favorite summer treat is ripe berries and/or melon with a bit of fancy salt sprinkled on top. Congratulations on your successful workshop! Thanks for sharing w such wonderful photos. My favorite summer snack (among many) would be figs w blu cheese on a chunk of Labrea sourdough baguette. Fabulous photos. Favorite summertime snack are the fresh peaches, best in a peach and tomato salad. Thanks for sharing your awesome photos! My favorite summer snack would be any flavored ice cream. Hmm… I like frozen lemon juice… homemade ice cream… fresh produce… goat cheese and whole-wheat crackers. All of it. It’s GOOD. I love frozen type smoothies…all natural and very cold and refreshing! fresh, raw kohlrabi! had a sample today at the farmers market and swooned. bought two big ones for home. I love all the summer fruit, especially bing cherries! My favorite snack of summer is something my friends wife served to me a few years ago. It’s celery that’s marinated in roasted sesame seed oil, lemon juice and salt and pepper, then chilled for about an hour. Crispy, refreshing and amazing! Right out of the garden tomatoes, sprinkled with a little kosher salt! Of course it was hard to pick my favorite because I also love and enjoy all the fresh in season fruit! Fresh figs are my favorite summertime snack. I wait all year for them to come into season! When it’s summer, it’s always fruit. Particularly here in Oregon, it’s all about the cherries and pears. And peaches, I guess, but I don’t eat peaches because of their furriness… >< But if I had to choose, it would definitely have to be watermelon! It just tastes better in the summer than at any other time of the year. Watermelon. I could eat my weight in watermelon and die a happy girl. I wish the watermelon-ness could last somehow. I haven’t yet figured out how to preserve that beautiful flavor. So I just eat the be-jeebees out of it when summer comes. Favorite summer snack: watermelon. Or sparkling wine. Maybe both. Wine and anything from the garden. Tonight its spicy stir-fried pak choy and pinot grigio. Cubed watermelon, I can probably eat half of one in one sitting. At the moment, and it does change quickly in the summer months as things come into season, caprese….Caprese on Stick for an appetiser, Caprese (gorgeous0 salad…and any other way we can think of to combine mozzarella, basil and tomatoes!! That is an awesome post. My favorite summer snack is pretty simple: watermelon! I eat so much during the summer months. Garden tomatoes…so good. Can’t wait!! Your pictures look amazing! My favorite summer time snacks are homemade popsicles or watermelon with a light sprinkling of salt. Favorites…..mmmmmm, field tomatoes, radishes, kohlrabi (not sure I spelled that right)….and for sweets…..Rainier cherries, watermelon, and colorado peaches. beautiful blog. Looks like you had fun…..
seeing as i ate half a watermelon today, it must be my favorite summer snack. looks like it’s a pretty popular one, too. raspberries, fresh off the bush … or, when the season is over, carrots and roasted red pepper hummus! Strawberries with balsamic vinegar. so simple…so delicious. Your workshop looked like a success! Congrats to you and your friends for all your hard work! I am currently hooked on home-made ice cream for my favorite summer “snack” – latest flavor? – Mexican Chocolate. Mmmmm! I’m a big fan of corn on the cob roasted on an open campfire. Sure it takes a while to cook, but it’s so worth it. Key Lime Pie…without a doubt! Absolutely love it! Mmmmm…. peaches!!!! I love them and I eat like one a day!!!! fave summer snack? ooh. stone fruits, especially flathead cherries, which are amazing. and couscous. lots of it. In many different ways. I’m sorry I do not have an US mail address. However I will leave a message: I love your recipes and your site. I have tried some of them and have found some of your tips really great, for I live in Mexico City, and sometimes the altitude issues have to be dealt with, and this no one seems to notice. Congratulations, and keep up the great work! What a wonderful time you seemed to have had. Are YOU local??? My favorite summertime treat would have to be Glacier Ice Cream – especially after tubing in Lyons. . .
Summertime snack? Marionberries right off the vine still warm from the sun, or cherries, mmm… cherries. I wait all year to eat my first bite of panzanella, made with homegrown heirloom tomatoes and basil, preferably served alongside a tall, frosty glass of Meyer lemonade! Lemon bars are by far my favorite summertime snack, yum! Tree ripened peaches and fresh picked blueberries! Yummy! My favorite snack is herbed goat cheese on crackers! Strawberries! When it is very, very hot, strawberry sherbert or ice pops. My favorite summer time snack is munching on fresh vegetables and fruit. Can’t beat it! Favorite summer time snack has to be roasted corn with real butter and cayenne pepper! Delicious! My favorite summer snack is gazpacho! I can’t get enough of it once my tomatoes start to ripen…I have 14 varieties growing here in colorado springs, i can’t wait til they start to ripen! I knew when you first mentioned the workshop that it would be amazing and your photographs prove it. I think the highlight for me, though, was seeing Kaweah ~ she always looks so happy. My favorite summer food is fresh fruit from melons to berries to peaches, preferably more than one at a time. I’d eat fruit three times a day if it contained protein whether plain, with a little cream or spiced up with a good chili powder and lime juice. Or salads. ;-) Thanks for a chance at the giveaway. I don’t know that I have a single favorite summertime snack. I’ve been eating a lot of popcorn lately–it’s fast and easy and you can do it in the microwave, thereby exposing yourself to no heat (only radiation, I suppose). Oh, well, of course–ice cream. I’ve been making a lot of it lately. apple-rose ice cream, grand marnier, caramel au beurre sale. Next two up are noyau and then s’mores. wow! I wish I could have attended… looks lovely! I love berries and peaches! This is a seminar I would have loved to attended-I am sure there was lots to be learned-I must say my food photography is horrid-there is no other word. Favorite summertime snack-homemade strawberry ice cream-although yesterday I could not resist making rice krispie squares. Choosing a favorite summertime snack can be difficult, especially when you like all of the locally grown fresh fruits and vegetables available during the summer. If I really had to pick, it would be salads, either fruit or vegetable. There is so much of an assortment available, that you can make up any type of salad that you fancy. Just let your imagination runaway with your creations. My favorite summertime snack is toasted baguette with ripe figs and goat cheese! Or frozen grapes. You are so talented! Looks like y’all had a great time too! My favorite summertime snack is fruit. All the wonderful peaches, plums and watermelon are just so good in the summer! Fresh blueberries! Once they’re done, then it’s fresh-squeezed lemonade (on the tart side) for a summer treat. My favorite snack would definitely be italian lemonade popsicles! :) They are soooo yummy! Thanks for the giveaway! Fresh, ripe berries have to be my favorite summer snack. They’re so rare and precious here in Wyoming! Tomatoes, in all kinds of different ways! Juice a honey dew melon with a small piece of ginger, a splash of lime juice, and simple syrup – drink over ice, or even better, freeze into a slushy granita! Cools from head to toe. 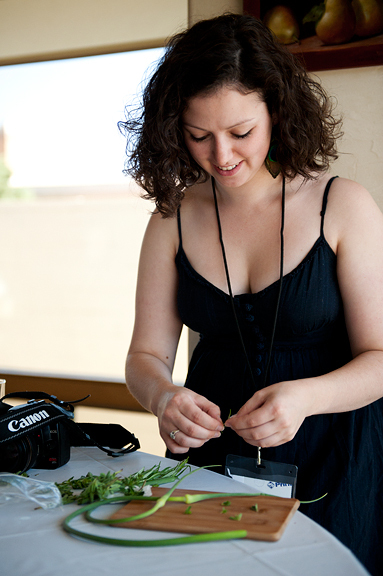 I wish there was a food photography workshop in Tucson, AZ! I’m sooo jealous! My favorite summertime treat would have to be fresh heirloom tomatoes from our local vegie stand topped with a little olive oil, balsamic and touch of salt and pepper! Favorite summertime snack…whatever is being harvested in the garden…watermelon, a tomato warm from the sun, green onion, cucumber. My favorite summertime snack is Iced Tea Popsicles. My favorite summertime snack was a common meal during Revolutionary times: Raw squirrel meat & whiskey. My favorite summertime snack are white nectarines and white peaches. In fact my little 5 year old gobbled up 3 white peaches I just bought! I think my favorite summertime snack has to be grilled fruit. Looks like a great workshop! Thanks for offering the Chef’s Catalog goodies! My favorite summertime snack is probably picking ripe Sweet 100 cherry tomatoes from our backyard plants and popping into my mouth! My favorite summer snack is panzanella with home-made goat cheese and home grown heirloom tomatoes and basil. Can’t wait for the first tomatoes to ripen!!! My favorite summer time snack would be ice cold watermelon. Love, love, love chips and guacamole!! Berries. Or peaches. Western Slope peaches are always so good! My favorite summertime snack is either watermelon or ripe peaches. Favorite summertime snack: fruit. Particularly stone fruits like peaches, but I also do love me some blueberries. Any of the seasonal fruits, whatever is ripe, right then! Right now, cherries! My favorite snack is a nice big bowl of shaved ice filled to the brim with berries and cut mango topped with a ribbon of condensed milk to tie it all together. Best on those really really hot days! Blueberries! The best snack there is. My favorite summer snack is really really cold watermelon! Eaten outside so I can spit out the seeds, of course! Peaches! Or a root beer float which is a rarely enjoyed treat, making it more delicious. Choosing a favorite summertime snack is easy- berries, especially raspberries! So tasty and good for you! My summer favorite is watermelon. we have a place up here that makes Italian Ice, but not like the type you get in the grocery store. This stuff is part sherbet, part gelato creamy and fruity and very yummy. Summer means proscuitto and melon…YUM! Fav summertime snack is cherries….just plain ol’ cherries right out of the bowl! Thanks for the giveaway! garden tomatoes. I crave them all year and live for August. Recently, I’ve developed a penchant for homemade guacamole and chips. I make it pretty spicy, but it is a cool, smooth snack for the summer. My favourite summer snack would be ICE CREAM! Favorite Summer Snack: Anything cold eaten outside. Ice Cream is popular. I’ve just recently begun to understand how important lighting is. Taking pictures is now a point and click affair, but taking good pictures is anything but! Sounds like your workshop was a success. Favorite summer snack right now is granita. So far this week (!) I’ve made coffee, mojito (yum) and honeydew with elderberry liquor. Who knows what next week will bring. Oops, gotta run, I hear the honeydew calling my name. Favorite summertime snack is fava bean paste on toast with fresh mozzerella. And its on the menu for tomorrow! The workshop looks wonderful. I’d love to see another one, with a focus on cooking – maybe Chinese? My favorite summertime snack is bruschetta. Especially when I get to use home grown tomatoes and basil. So easy and so tasty. Thanks for the giveaway. Looks like it was a sucessful workshop! My favorite summertime snack is watermelon. Yummy! My favorite summertime snack is watermelon!!! My favorite summertime snack would be fresh strawberries or cherries all by themselves or I love blending strawberries, yogurt, milk, ice and some chocolate protein for a healthy, cool smoothie. There’s also nothing like juicy tomatoes with fresh mozzarella and basil. My favorite summer snack is probably fruit. I love watermelon, but any summer fruit will do. I love fruit salad, too! I love frozen red grapes. So easy and so refreshing. With every post I visit on this series featuring the workshop continues to make me green with envy. Please, please consider holding a workshop here in Canada, possibly Toronto? Hands on learning is so effective! My favorite snack in the summer is freshly picked raspberries, in particular, the raspberry tart from a local farm. Watermelon! When I was pregnant (3rd trimester in summer in Florida) I ate almost nothing but fruit, saltines, and burritos. Yup, chowing half a watermelon at a time was…charming, I’m sure. I love me some fresh blueberry pie, nice and warm from the oven with chocolate ice cream on top. Soo good and to think I discovered it while working in Alaska. Definitely a tried and true favorite of mine even if I do get odd looks quite often while eating it. maybe greek salad: cucumber, tomato, onion, green pepper, feta, olive oil, vinegar, salt and pepper. i omit the olives because i’m a bad person. I like cucumbers and onions marinated in vinegar, sugar, and water. Like my mom used to make! To beat the summer heat of New Mexico, my favorite summer treat is a platter of thick sliced watermelon with a generous lashing of lime zest, a light sprinkle of lime juice and a few flakes of salt. Your photos are amazing! Favorite summer snack–ice cream, most any flavor. My favorite summer treat is fresh fruit – blueberries, strawberries, watermelon. My favorite summertime snack is bruschetta. I love peas picked straight from my garden. The next would be fresh zucchini sauteed with garlic and butter! Fresh salsa-whether traditional tomato or fruity…love it. Can’t beat those summer flavors! 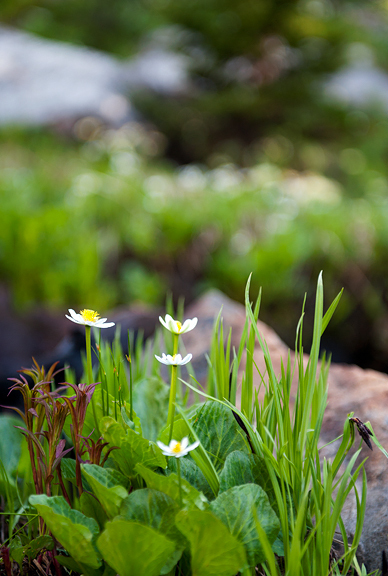 The picture of the glacial pond is the one that captured my heart! Colorado is magical in the summer! Very neat perspective with your photos! watermelon! crisp, cold, sweet watermelon!!! My favorite snack is sliced mango with a spicy salty sprinkle. It’s making my mouth water. Sorbet. Made your Strawberry Sorbet for the 4th and it was fantastic! Best stuff I have ever had and will now be a staple in my freezer going forward. Fruit, ice, yogurt and kale picked straight from garden smoothie! What a beautiful setting – perfect for such a creative undertaking. I’m sure that you put on a phenomenal workshop! Cherry Tomatoes straight out of the garden! beautiful pics! Hmmm… frozen fruit popsicle. Yummy! I stumbled onto your site — very nice. My favorite summertime snack is sliced peaches with a bit of sugar. Yum. I love to cut up pineapple, mango, strawberries, honeydew and cantaloupe then add a dollop of honey greek yogurt…yum!! Hands down. In caprese salad with fresh mozzarella. My favorite snack for summer is salted tomatoes. And if I am going with a meal it would be caprese salad (with fresh everything) and toasted garlic bread. Yum! my favorite summer snack: blackberries! I love to eat cold watermelon out the fridge! anything with blueberries. blueberry muffins, blueberry boy bait, blueberry smoothies! The best summer snack is ice cream…doesn’t matter what kind. My favorite summer snack is homemade ice cream! I love homemade mixed in a can the ol’fashioned way! Ice cold watermelon on a humid summer day! garden tomatoes, goat cheese and fresh basil on toast. Off the vine, ripe tomatoes in any form! I’d love to learn to take photos like that! And as for my favorite summer snack it would have to be a quick pickle of sliced cucumbers and red onions- we always always had a jar (or 2) in the fridge growing up and I would munch on them constantly. favorite summer snack is a large cold, crisp raw cabbage leaf spread with peanut butter and rolled up into a log. very refreshing and a kid favorite too! A mango all to myself to be eaten in the sunshine. Wow! Wish I could’ve been there! You all look like you had a wonderful time. I’d love to learn more on how to use my camera to take better pix. And the food… Man oh man my mouth is watering. It all looks wonderful. As for my favorite summer snack, good Greek yogurt with fresh berries (best is Blueberries) or mango. Thanks so much for sharing all your wonderful gifts of knowledge with us. i like chinese bing. it’s shaved ice topped with an assortment of toppings of your choosing. i like to top mine with red beans, oatmeal, little tapioca balls, those small flour balls (tang yuen? ), and almond jelly. so refreshing in the summer! Ice cold watermelon slices with salt, YUM!! Tomato sandwiches with mayo and basil. Holy moly. My favourite summertime snack is yogurt with fresh berries! My favorite summertime dish is a cool dessert consisting of mandarin oranges, crushed pineapple, sugar-free orange gelatin, cottage cheese and cool whip. Mix together and say Yummy! My most favorite summer snack is large prawns wrapped in a big ole’ honkin basil leaf and a piece of proscuitto. Throw them on the grill and wow your taste buds! Can i pick two? One savory one sweet. Homemade pico de gallo with ingredients from my garden…and grilled colorado peaches topped with fresh homemade ricotta and a drizzle of honey…MMmmMMmm! mine would definitly have to be strawberries and vanilla ice cream. Mmmmm, Mmmmmmm, Mmmmm! Would love to win the swagbag. My favorite summer snack is fresh tomatoes with cucumbers. That looks like a great workshop! My favorite summer snack is definitely homemade ice creams and sorbets!! Gorgeous pics! Sounds like a good time! Summer has a lot of great snacks…but I love the popsicles from Mexican markets…they have really interesting flavors…YUM! Favorite summer snack: raspberries, blueberries or cherry tomatoes, right off the vine, eaten while sitting in a patch of sunshine in my garden! Your workshop looks absolutely amazing, I hope you will turn it into an annual offering! Tomato sandwich made with tomatoes fresh off the vine and nice crunchy bread. Yum. Definitely grilled steak out by the pool… THAT is summer. shrimp ceviche with lots of avocado! Awesome photos – almost like being there! My favorite summer treat: fresh tomatoes from the garden, fresh basil, sea salt and ground pepper! Yumm! locally made ice cream/gelato can’t be beat…that would be my favorite summertime snack! My favorite summertime snack is a fresh fruit salad with a nice glass of wine! 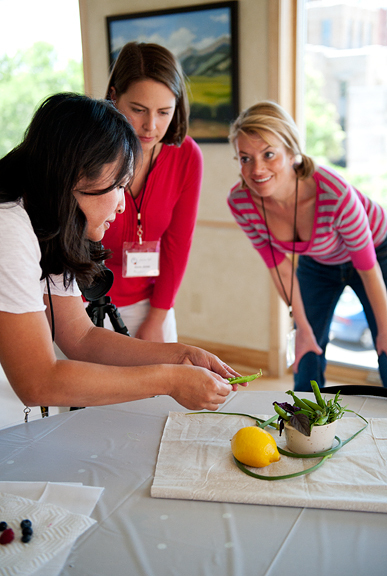 Enjoyed learning about your workshop in Boulder, CO.
My favorite summertime snack is gazpacho – it’s basically a bowl full of summer, and I can’t get enough. In the 100 degree heat, homemade peach ice cream is the best. Refreshing! my favorite summertime snack is homemade strawberry or peach frozen yogurt. Okay folks! Thanks for your entries – we’ll let Kaweah pick a winner in the morning. Any other comments beyond this point will not be considered (sorry!). No luck in joining this giveaway! It sure is generous! I love everything in the swag bag! The workshop looked fantastic! It must have been really enriching! What a shame to miss it! Lovely, a great sharing event! Oh wow! It looks like everyone had a great time and learned a lot! I WISHED there was something like this in my area!! Oh Jen, I’m so sad I couldnt make it to your workshop, I really hope you do it again soon! My husband is a keen photographer and I know its a weekend that we’d really enjoy! Home made ice cream. I made chipotle chocolate last week; that’s the perfect flavor to beat the heat!